Quite a few of you picked out the tree jacket from the Gretel photos yesterday – so here’s the official report! This one took less than a week to knit! Now that’s a quick sweater. The yarn’s definitely captivating, plus the pattern’s simple and chunky enough that I was able to get it out really quickly. As I posted about before, I was pretty short on yarn. I had seven matching skeins, plus the one pinky one – it seems to have worked out fine! I could’ve done the smallest size, as it turns out (and I’m 36″, so it was a gauge issue) and then I might’ve been able to make the sleeves longer or something. I knit the second size and it’s a bit baggy under the arms. I do love the garter stitch yoke, and I even love the jog at the beginning of the round. The biasing of the lace in the body is really flattering! That was a nice surprise. I ended up using three skeins of yarn for the yoke, another 2.75 for the lace in the body (plus a bit of the pinky one for the ribbing) and then the remaining 1.25 skeins for the sleeves. It was a bit hairy – I knit the body long enough, and added a couple extra rounds of ribbing to make sure it wouldn’t roll. Then I weighed the remaining yarn and knit both sleeves at the same time (okay, alternating every couple rounds) and decreasing right away – the pattern has you do quite a few inches straight before decreasing. I managed four decreases before running out of the matching yarn. Then I switched to the pinky skein and to stockinette, and just kept going until I was out of yarn. The sleeve length actually works really well for me, so I’m happy. And no leftovers! I loved knitting this sweater, and it turned out great. What more can a knitter ask for? congrats on the knit! She looks great and how I love a fast sweater project. Awesome! I didn’t even notice in the Gretel pic, but I went back to look, and there it is. :) I think the pink edging is great, and the sleeve length seems very wearable. It’s really cute! I’m curious about the biasing on the body though. It doesn’t look like it biases on the model on the pattern page – did you do any mods or do you think their pics are slightly deceptive? It looks like a great layering piece, and the two colors are a nice touch. Ahhh! That looks so awesome! It looks good! And I like the bias too. Definitely second ann’s comment. I find the biasing a little surprising, though it is flattering both ways. Awesome, awesome! The Fibre Company Terra is the best! oooo… I like!! very pretty!! Gorgeous! I’m curious, though, as that’s on my to-knit list for next winter – does one have to do biased lace? Or is it possible to work it with the lace running vertically down the body? ok, how DO you knit so fast? you’re incredible! Great sweater. I can’t believe you knit it so fast! looks quite comfortable and cute! It really did turn out great — I love the pinky edges. Lovely! And so cozy-looking, too. It’s so beautiful!! So modern and cute…and flattering. Very nice! 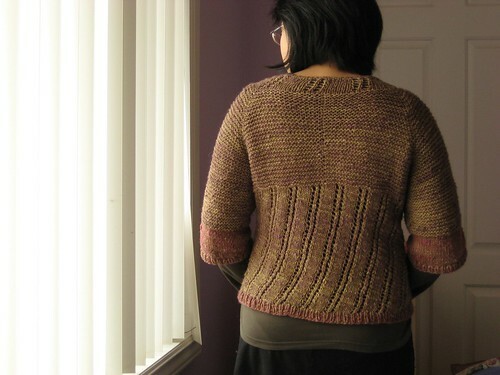 I love the 3/4 sleeve and the garter stitch yoke. I think I’ll put it on the queue. Nice save, the different color looks like a feature rather than a fix. And I love the jog, too. 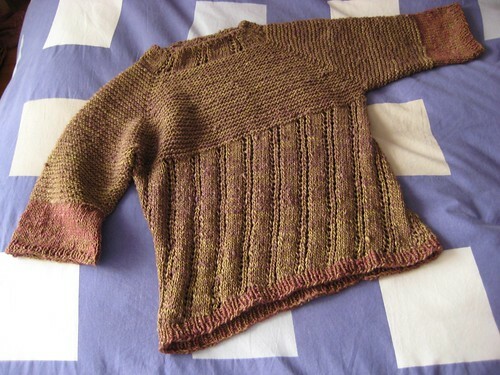 I finished that sweater in Sept 03, cast on for my next one last month. Was supposed to be knitting along with a friend… but she is ahead of me. I just don’t have my heart into it, though it looks very promising! Congrats on a one-week sweater. You have a rare skill. Go, Grrl! I really like the color change, especially since it comes with a stitch change that highlights it. Totally a design feature, not a mistake! I love your color combo! I also did the medium and think I could have gotten away with the small. The sleeves feel a little large. Overall, a fun knit. Yours looks fab! I still think it looks like it’s made of two flavours of gingerbread. Fabulous though. BTW, you’ve Made My Day: http://janemumbles.blogspot.com/2008/02/revenge-of-sweater-angst.html (even if you’ve already had it once). i love this sweater! it is adorable. I really like that sweater – it looks like it is a very flattering knit and really warm too. Oh.My.God. It is love at first sight. What a beautiful sweater! I was on the fence about knitting the Tree jacket and now it is decided – I have to knit it. And to be more specific…. I think I may have to knit one almost exactly like yours! Is that wrong?? The sweater looks great on you! Your color choices work really well together. Everything on here is so inspiring!! Love the hat and the tree jacket. Your tree jacket looks great! I really like the way you did the neck. I have been trying to make up my mind on this sweater – but now I am inspired! Thanks!